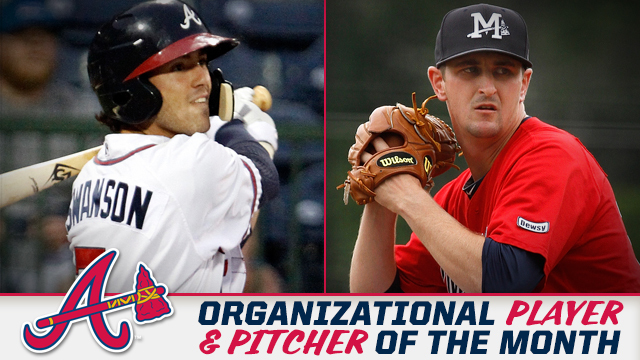 PEARL, MS -- The Atlanta Braves announced the minor league pitchers and players of the month for May. For the Double-A Mississippi club, right-hander Stephen Janas and shortstop Dansby Swanson were selected for the monthly accolades. Janas, 24, appeared in nine games during the month of May. He notched three saves and posted a 1.15 ERA, striking out 15 in 15.2 innings of work. Janas was 3-2 with three saves and a 1.89 ERA in 18 games with the M-Braves before his promotion to Triple-A Gwinnett this week. The right-hander allowed runs in just four of those appearances, holding opponents to a .200 batting average. Janas split last season between High-A Carolina (5-0, 0.49) and Double-A Mississippi (2-8, 4.87) where he started six and 13 games, respectively. He was selected by the Braves in the sixth round of the 2013 draft out of Kennesaw State University. The Braves No. 1 prospect joined the M-Braves at the end of April. During the month of May, Swanson posted a batting average of .265 with three doubles, two triples, three home runs and 12 RBI. Swanson is hitting .269 with 11 extra-base hits and 17 RBI in 33 games. The 22-year-old shortstop also ranks among Baseball America's Top 100 in baseball at No. 17. Prior to his promotion to Double-A, Swanson was hitting .333 with 12 doubles, a homer, 10 RBI and seven stolen bases in 21 games at High-A Carolina. He was selected first overall in the 2015 draft by the Diamondbacks out of Vanderbilt. The Kennesaw, GA, native was acquired by the Braves along with OF Ender Inciarte and RHP Aaron Blair from the Arizona Diamondbacks in exchange for RHP Shelby Miller and LHP Gabe Speier on December 8, 2015.